And so ends “A Pound Of Gruff”. You mean the Toto we’ve been seeing in this series isn’t the REAL Toto ?!? If that’s true, then who else knows this secret twist ? Wow, a burden for the Scarecrow indeed. Also, inner dialogue journals…are an interesting idea. It makes me wonder what does Lion and Tin Man think about why the others aren’t around to hear their thoughts ? Great way to end this tale. I can’t wait to see what comes next in this world of yours. These are all internal dialogue journals, however THIS one is actually internal monologue in that it is not shared by the character with anyone but the audience:) What are the other three currently thinking? 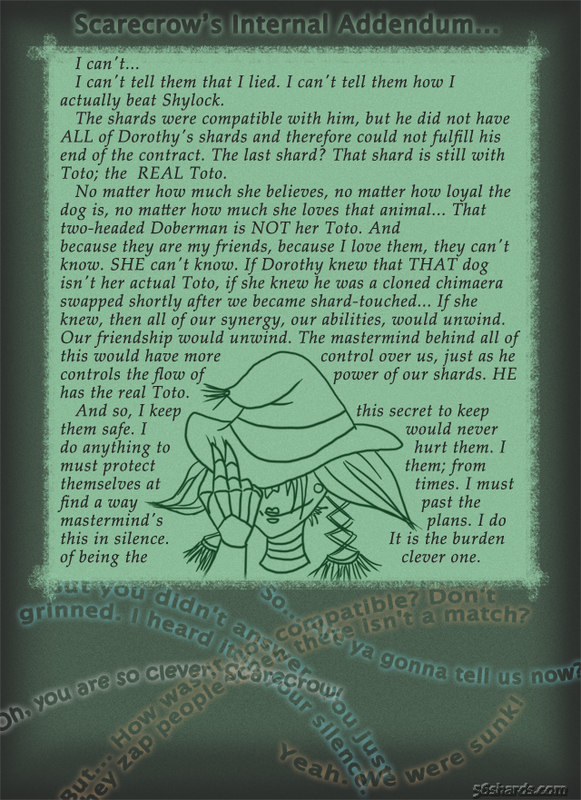 This final journal occurs at the same time as the prior one, hence the ghosty dialogue at the bottom which is what Scarecrow hears as he’s thinking these thoughts; thinking them secret from the others. And for a sneak peek at what the first journal is, it is up on my Patreon account:) See the above link Velvy is disintegrating at the top of the page. I’d like to put a link here. This revelation about the dog not being the real Toto had been foreshadowed.